Born in Bath, Tom Raskin studied at the RNCM in Manchester and New College, Oxford, before going on to become a Britten-Pears Young Artist, studying with both Andreas Scholl and Richard Egarr during his time at Aldeburgh. In 2000 he was awarded the Anne Ziegler Prize, followed by the Freckleton Prize in 2001, and was the recipient of a major Scholarship from the Peter Moores Foundation which has funded study both in Italy and London. His international concert appearances have included St Mark's Basilica, Venice for Monteverdi Vespers, Lille for Bach’s B Minor Mass, and Siberia for Messiah in the Novisibirsk Festival, in addition to Malta for an Opera Gala. In the UK he has sung regularly for the London Handel Festival at St George’s, Hanover Square, Handel’s L’Allegro in Cambridge and Monteverdi Vespers in Bath Abbey and Chichester Cathedral. Recent appearances are Rossini Stabat Mater and Puccini Messa di Gloria in Colchester, Handel’s Susanna for Suffolk Villages Festival, Rossini Stabat Mater and Mozart Requiem for Mountain Ash Choral Society, Dee Palmer’s Nuremberg Cantata in Hove, Christmas Oratorio in Dedham, Messiah for Harpenden Choral Society and Monteverdi Vespers in Dorking. In 2013 Tom reprised Britten’s Serenade and St Nicolas for Colchester Choral Society and sang St Nicolas in Worcester Cathedral and Jonathan (Handel’s Saul) in Holland; in 2014 he sang Rossini’s Petite Messe Solennelle for Harrow Choral Society and Harpenden Choral Society, Evangelist St Matthew Passion in Tonbridge, St Matthew arias in Norwich Cathedral and Dixit Dominus with The Sixteen in the Chapelle Royalle, Palais de Versailles. Highlights of his operatic career so far have included L’Athelète Castor et Pollux, conducted by Sir John Eliot Gardiner at the Salle Pleyel, Conte Conte d’Ory and Appolonia in Haydn’s La Canterina for New Chamber Opera, Fenton Falstaff at the Belle-Ile Festival, Bullfighter in Golitsov’s Ainadamar with the City of Birmingham Symphony Orchestra, Truffaldino in L'Amour des trois oranges, Roderick in Philip Glass’s The Fall of the House of Usher in Oxford, and Patacha in Chabrier’s L’Etoile for Opéra de Nimes, Don Ramiro Cenerentola for the Mananan International Festival, Ralph Rackstraw in Gilbert and Sullivan’s HMS Pinafore for Opera della Luna and Lionel in Flotow’s Martha for Opera South. 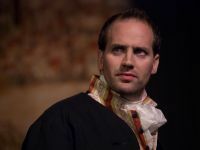 Other roles include Almaviva Barbiere di Siviglia, Oebalus in Mozart’s Apollo e Hyacinth, and Silango in Gluck’s Le Cinesi at the Wigmore Hall and Cheltenham Festival in 2009. He sang Kaherdin Le Vin Herbé (Frank Martin) for OT Theatre, Rotterdam, and Sir George Weinberg's Lady Magnesia with The Liverpool Philharmonic and Ensemble 10/10, and returned to Liverpool and Huddersfield for Gary Carpenter's Closing Time in 2010; highlights of his engagements in 2011 included Postillon Postillon de Longjumeau for Opera de Baugé in July, Marquis de Chat Zar und Zimmermann for Opera South and Amalekite in Saul conducted by Harry Christophers with The Sixteen in the Barbican, which he then recorded in 2012. In 2012 he returned to Opera de Baugé for Almaviva Barbiere di Siviglia, and sang Agenore Il Re Pastore for New Chamber Opera, a role he repeated in January 2013. He played Patrick in Tales from Babel: Musical Adventures in the Science of Hearing throughout the UK during 2013. In 2014, he returned to Oxford to sing Nencio in Haydn's L'Infedeltà delusa, and in 2015 Cavaliere di Rippafratta in Salieri's La Locandiera. Reflecting his move into bigger lyric repertoire, in June 2015 Tom sang Calaf in Act 1 of Turandot in West Road Concert Hall, Cambridge. Recent concert work includes Verdi’s Requiem for Festival Chorus, in St Luke’s, Battersea, Rossini's Stabat Mater broadcast live on BBC Radio 3 from King's College, Cambridge, and a return to Norwich Cathedral for Messiah.